In 2012, for the preliminary estimated corporate production of the yellow metal, total volume of gold mined by the top 10 publicly traded companies dropped roughly 3.4%, from 32 Moz in 2011 to 30.9 Moz. Seven out of 10 companies faced decreases in their attributable gold output while only three of them have reached growth (Figure 1). Figure 1. Provisional attributable gold production by 10 leading companies in 2011/2012, Moz of gold except Gold Fields and Kinross, where Moz of equivalent gold used (data and expectations retrieved from corporate reports). With 7.42 Moz of gold produced in 2012, Canadian Barrick Gold Corp. (TSE:ABX) holds first place in global ranking, well ahead of its pursuers. Compared to 2011, Barrick’s gold output declined by 3.4% because of production decreases in all regions of its presence except North America. However, Barrick Gold achieved its production target for 2012. The US-based Newmont Mining Corporation (NYSE:NEM) ranks second in the global gold competition and produced about 4.98 Moz of the precious metal in 2012, a 4% decline on 2011 (5.19 Moz), due to a dramatic decrease of gold output at the Batu Hijau mine (-79%) and significant declines at Newmont’s other Asia Pacific operations (-6%). For third-ranked AngloGold Ashanti Limited (NYSE:AU), 2012 was a difficult production year due to safety stoppages and strikes at its South African operations. 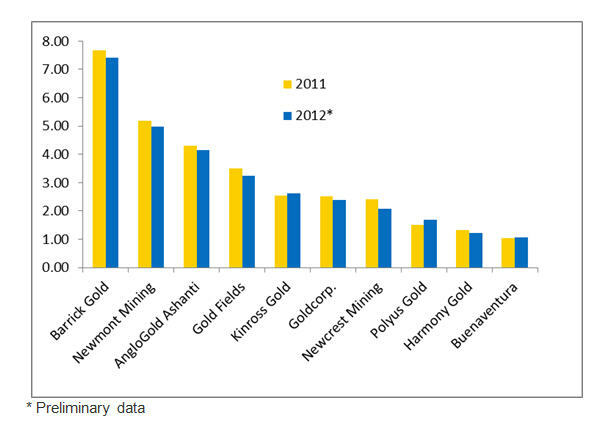 The company expected to produce roughly 4.16 Moz of gold in 2012, or 3% less than in 2011 (4.30 Moz). Another South African company, Gold Fields Limited (NYSE:GFI), currently ranked fourth, expected to produce 3.3 Moz of gold equivalent in 2012, or 6% lower than in 2011 (3.5 Moz). This decline is mainly due to a fire at Ya Rona shaft (formerly Driefontein 4 shaft), illegal strike action at KDC East and West, and a slightly lower grade mined at South Deep. Canadian Kinross Gold Corporation (TSE:K), fifth in world gold production rankings, produced 2.62 Moz of gold equivalent in 2012. This volume exceeded the Kinross’ guidance of 2.5-2.6 Moz of gold equivalent and is 3% higher than 2011 production totals (2.54 Moz of gold equivalent). In the first nine months of 2012, Kinross saw a scheduled decline in grades at Kupol project and increased planned reliance on lower-grade stockpile ore at La Coipa mine. The full-year increase was primarily due to stronger production at Fort Knox. Sixth-ranked Goldcorp Inc. (TSE:G) produced 2.39 Moz of gold in 2012, or 4.8% less than in 2011 (2.51 Moz). This decline was due to lower grades at Red Lake mines (Canada), lower grades and lower recovery at Porcupine mines (Canada), lower grades and lower tonnage processed at El Sauzal mine (Mexico), as well as lower grades at Marlin mine, Guatemala. Seventh in the ratings, Australian Newcrest Mining Limited (ASX:NCM), produced approximately 2.07 Moz of gold in 2012 calendar year, a 14% decline on 2011 (2.42 Moz). The main reasons of such a significant decrease are, as follows: lower feed grades and volumes of ore mined at Cadia Valley Project (New South Wales, Aus. ), production interruption at Lihir Mine (Papua New Guinea), lower mill throughput at Telfer Mine (Western Aus. ), as well as the combination of planned lower grades and unexpected poor ground conditions at Gosowong Mine in Indonesia. At eighth place in the global gold race, Russian origin Polyus Gold International (LON: PGIL) was the only company among the 10 largest gold corporate producers that demonstrated a significant increase in gold output within the last year. In 2012, it produced around 1.68 Moz of gold, that is 12% higher than in 2011 (1.50 Moz). Polyus officially announced that “the record double-digit growth rate achieved in 2012 came as a result of continued investment and optimization of our mines, delivering significant increases in production at all of our Russian operations, with an exceptional performance delivered by our largest mines, Olimpiada and Blagodatnoye, and steady improvements at Kuranakh”. South African Harmony Gold Mining Co. (NYSE:HMY) holds ninth place, and produced around 1.22 Moz of gold in 2012, an 8% decrease compared to 2011 (1.32 Moz). Peruvian Compania de Minas Buenaventura SA (NYSE:BVN) sits in tenth place with expected attributable gold production of 1.06 Moz, which is slightly higher (+2%) than in 2011 (1.04 Moz). Canadian Yamana Gold (TSX:YRI) overtook Buenaventura by the volume of gold equivalent ounces produced in 2012 (1.2 Moz, +9% growth on 2011), but a little behind the Peruvian company when considering output of gold ounces (1.03 Moz). Looking for 2013 forecasts, world gold production will likely be higher compared to 2012 as most of the companies plan to increase their gold output. In any case, given the significant unpredictability of the gold mining industry, surprises can be expected during the year. Note: For corporate attributable gold production, figures used are from actual official data or companies’ expectations for the 2012 calendar year. Wherever possible, calculated gold ounces are quoted instead of gold equivalent ounces. Only two companies out of ten (Gold Fields and Kinross) did not provide breakdowns for gold ounces produced.